Great service. On time and very good driver. So easy to arrange and a nice way to get from ship to centre of Rome. Transfer was perfect. Cheaper than thru the cruise. He was punctual and pleasant! They picked us up right outside the cruise terminal and took us straight to the hotel. It was just what we needed. The only suggestion I have for Viator on this is to make it easier to book this online. The hotel we stayed at was a few miles from the airport and I had to call Viator to book this so that we would be taken directly to our hotel as there was not an option to enter hotel information. It took approximately 45 minutes on the phone to accomplish this. The other thing that I encountered is that when I got our voucher, there was not a specific pick up time and I didn't realize it until we were already on our trip. I ended up communicating with the provider directly to get a time. The driver showed up right on time and got us to our destination. I recommend the service itself. Our driver was right there waiting for us, as soon as we got off the ship. He was a safe driver and even gave us some helpful advice and recommendations before dropping us off. Add style to your trip, you deserve it. Marco treated us as we departed the baggage claim area and gave us a great tour on our way into the city as well as provided some great ideas for dinning. After our Med. cruise ended we had a few days in Rome to see the city before flying home. Our group of 4 took a private transfer to our Rome hotel rather than try to navigate the buses and trains needed to 'do it ourselves' Our driver was on time, professional and arrived with a big, clean van to hold all of our luggage and us comfortably. 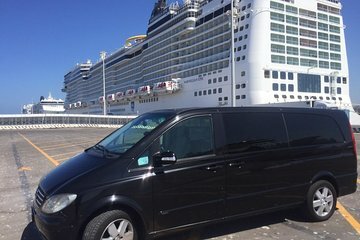 We did a 'walk off' from the cruise, so we had to roll all of our suitcases off of the ship ourselves, but it was very easy and the terminal where we met our driver was much closer than I thought. It took 5-10 minutes from the time we left our cruise cabins til we were in the van on the way to Rome.